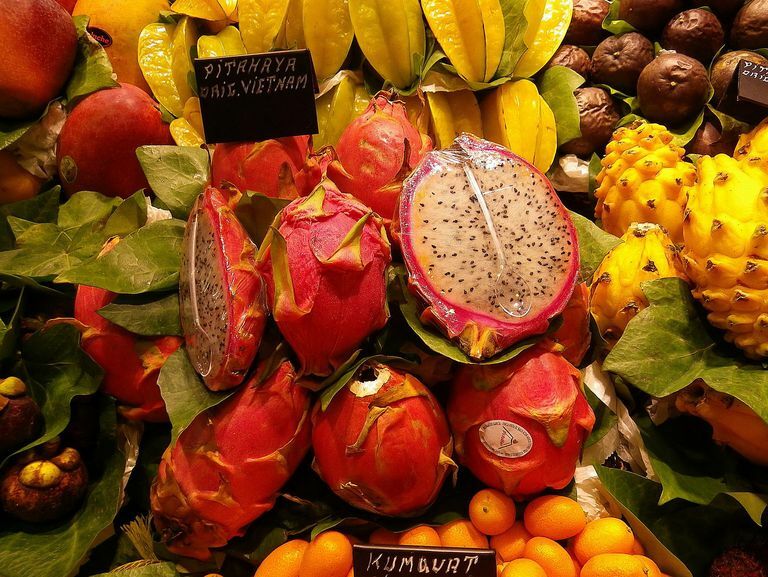 This fruit at a market in Barcelona, Spain, is known in Spanish as "pitahaya," "pitaya," or "fruta del dragón.". Just as the English of Great Britain or South Africa isn't the English of the United States, so too is the Spanish of Spain different than the Spanish of Argentina or Cuba. While the differences in Spanish from country to country aren't so great as to block communication, knowing them will make life easier in your travels. The pronoun vosotros as the plural form of "you" is standard in Spain but is nearly nonexistent in Latin America. In other words, while you might use ustedes to speak with strangers in Spain and vosotros with close friends, in Latin America you would use ustedes in either situation. Latin Americans also do not use the corresponding conjugated verb forms such as the hacéis and hicistes forms of hacer. The singular formal pronoun for "you" is usted everywhere, but the informal "you" can be tú or vos. Tú can be considered standard and is universally used in Spain and understood throughout Latin America. Vos replaces tú in Argentina (also Paraguay and Uruguay) and can also be heard elsewhere in South America and in Central America. Outside of Argentina, its use is sometimes restricted to certain types of relationships (such as especially close friends) or to certain social classes. Both the preterite and present perfect tenses are used to talk about past events. In most Latin American Spanish it is usual, as in English, to use the preterite to discuss something that happened recently: Esta tarde fuimos al hospital. (This afternoon we went to the hospital.) But in Spain the present perfect is often used: Esta tarde hemos ido al hospital. The most noticeable difference in pronunciation of European Spanish and that of the Americas involves that of the z and that of the c when it comes before an e or i. In most of Spain it has the sound of the "th" in "thin," while elsewhere it has the sound of the English "s." Spain's sound is sometimes incorrectly called a lisp. Where yeísmo occurs, the sound varies from the English "y" sound to the "j" of "jack" to the "zh" sound. In parts of Argentina it can also take on the "sh" sound. In standard Spanish, the s is pronounced much like that of English. However, in some areas, especially the Caribbean, through a process known as debucalización, it often becomes so soft that is disappears or becomes similar to the English "h" sound. This is especially common at the end of syllables, so that ¿Cómo estás?" sounds something like "¿Cómo etá?" The standard pronoun for "him" as a direct object is lo. Thus the usual way to say "I know him" is "Lo conozco." But in Spain it is very common, even sometimes preferred, to use le instead: Le conozco. Such use of le is known as leísmo. The spelling of Spanish is remarkably standardized compared with that of English. One of very few words with acceptable regional variations is the word for Mexico, for which México is usually preferred. But in Spain it is often spelled Méjico. It also isn't unusual for Spaniards to spell the U.S. state of Texas as Tejas rather than the standard Texas. Names of fruits and vegetables can vary considerably with region, in some cases because of the use of indigenous words. Among those with multiple names are strawberries (fresas, frutillas), blueberries (arándanos, moras azules), cucumbers (pepinos, cohombros), potatoes (papas, patatas), and peas (guisantes, chícharos, arvejas). Juice can be jugo or zumo. Among the everyday objects that go by regional names are cars (coches, autos), computers (ordenadores, computadores, computadoras), buses (buses, camionetas, pullmans, colectivos, autobuses, and others), and jeans (jeans, vaqueros, bluyines, mahones). Common verbs that vary with region include those for driving (manejar, conducir) and parking (parquear, estacionar). Every region has its own collection of slang words that are seldom heard elsewhere. For example, in some areas you might greet someone with "¿Qué onda?" (similar in meaning to "What's happening? "), while in other areas that might sound foreign or old-fashioned. There are also words that can have unexpected meanings in some areas; a notorious example is coger, a verb that is used routinely to refer to grabbing or taking in some areas but that in other areas has a strongly sexualized meaning. The most significant regional differences in Spanish usage are those between Spain and Latin America. Within Latin America, the most significant differences can be found in Argentina and some areas nearby, which use vos instead of tú. Although the names of some everyday objects vary with region, the strongest differences can be found in names of foods and in slang.